Two extra pocket in front, enough space can hold or storage your additional accessories, such as charging cable, mouse, mouse pad, power bank, etc. It can hold almost all laptops with 15-15.4 inch such as for Macbook, for Samsung, for Sony, etc. 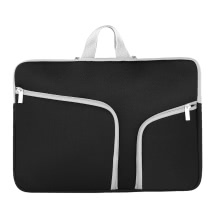 Laptop bag can protect your laptop from scratches, shock, dust, water, etc. Besides, t&apos;s durable and wearable with long lifespan. Three pockets makes your laptop and accessories in order so that important accessories can easily be found with neatly placed. Light and portable bag will not be a big burden when taking your laptop outside. Take it anywhere without any burden.